Barbecue. BBQ. Barbeque. No matter how you spell it, or which way you cut it, barbecue is to Alabama as pulled is to pork. It’s no surprise then that Alabama is stuffed with mouth-watering barbecue joints, ranging from the smallest of mom-and-pop shops to large franchises. Each of the following 10 capture the magic and taste of the South. L.A. Barbeque in Summerdale, Alabama, preps and cooks all of their meat in-house, hand rubbing every piece with their “top secret” blend of seasonings, before smoking it with pecan for what can only be described as a “l-o-o-o-o-n-g” time. Stop in for lunch or dinner and try the chopped pork plate, chicken plate, or rib plate. Salads are available for lighter options. L.A. Barbeque is happy to cater your event, or rent out their new banquet hall for your next event or party. Whitts Barbecue has smoked up their famous meats since 1966, and have since expanded to three Alabama restaurants. The menu is straightforward, leaning on the barbecue basics that have made Whitts a resounding success for over 50 years. 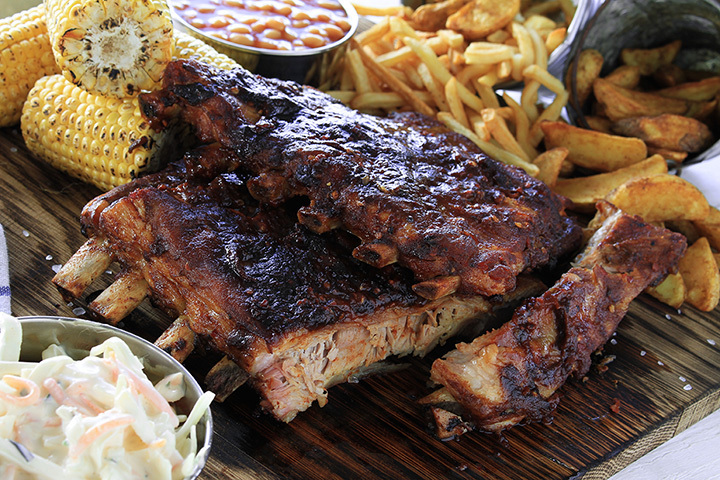 Try the pork, beef, turkey, or ribs, with a side of slaw, baked beans or potato salad. The stuffed potatoes are a new addition, and are potatoes stuffed with your choice of meat. Get a couple of cookies for the road with your lunch box. Lawlers Barbecue may have started out in 1978 as a “little barbecue joint,” as the owners describe themselves as, but almost 40 years and nine locations later, it’s hard to describe anything at Lawlers as little. With locations in Athens, Cullman, Madison, Monrovia, Huntsville, Meridianville, and Owens Cross Roads, wherever you are in Alabama, you’re never far from a Lawlers. Whether you’re cruising through the drive thru or need an event catered, Lawlers has you covered. Order barbecue by the pound or in groups. Make sure to check out their Monday, Tuesday, and Wednesday specials to save a little extra. Big Bob Gibson Bar-B-Q has taken their 75 years of barbecue experience and translated it into two restaurants, books, sauces, franchises, and a BBQ World Champion title. With over 50 awards under their belt, you know you’re getting quality food at Big Bob’s. Bring home a family feast, which comes with two pounds of barbecue plus two quarts of sides. The tailgating and ultimate barbecue feast options exist for larger parties. If it’s just you, consider one of the real pit barbecue sandwiches or combo plates. With Big Bob, you can’t go wrong with anything. Chester’s Barbeque in Phenix City, Alabama sticks to the basics. Order ribs, chicken, chipped barbecue sandwiches, and/or hot dogs with various condiments. The sides are extensive and run the gamut of Southern comfort food, including potato salad, baked beans, bread, corn on the cob, collards, mac and cheese, homemade sauce, and homemade slaw. Get you a piece of sweet potato pie, homemade banana pudding or a slice of cake for just $2.50. Chester’s may not be fancy, but their food speaks for itself. Dreamland Bar-B-Que Ribs is one of the most popular bar-b-que joints in the state, with locations in Roswell, Birmingham, Mobile, Tuscaloosa, Tallahassee, Inverness, Duluth, Huntsville, Montgomery, and Northport, in addition to concession locations and the food truck. Known for their bar-b-que ribs since 1958, Dreamland has expanded to include sandwiches, chicken, wings, and more. Menus may differ slightly by location, but almost everything is available for online order, including their incredible sauces. Local Joes in Rainbow City, Alabama, has been featured on the TV programs Taste of Alabama, 33/40 News, and Absolutely Alabama, as well as in Gadsgen Style Magazine for their delicious barbecue ribs. Local Joes is an old-fashioned family store nestled in the foothills of the Appalachian Mountains, harkening back to a simpler time. In addition to the storefront, the back is full-on barbecue joint, with ham, pork, chicken, turkey, sausage, and baby back ribs smoked daily. Try one of their sandwiches while you peruse the shop or, if you’re feeling decadence, a plate of nachos. Saw’s BBQ has two locations in Birmingham and a third in Homewood, Alabama. Taylor Hicks, of American Idol fame, is a co-owner, helping to cultivate the so-called “upscale dive” atmosphere. Each location has a slightly different menu, but customers can count on SAW’s Original pulled pork, smoked chicken, pork plates, ribs, dogs, and stuffed taters aplenty. The sides include southern favorites, like chips and mac and cheese, but also add deviled eggs to the mix. 306 BBQ has three locations, one in Athens, one in Madison, and one in Florence, Alabama. According to their website, “306 BBQ serves authentic slow cooked, pit smoked barbecue” with only the highest quality beef, pork, and poultry. Meats are smoked with hickory wood and dry rubbed. Since 2011, 306 has served their communities with tantalizing barbecue and fundraising events. 306 is happy to offer catering and banquet services, too. Bob Sykes Bar-B-Q in Bessemer, Alabama has been in the barbecue business since 1957. The folks at Bob Sykes use the “old-fashioned” method of barbequing pork and chicken over “slow fired hickory wood.” Place your order online and contact them about catering. Meat options include pork, ribs, chicken fillets, smoked turkey, and smoked ham, along with sandwiches, family orders, salads, and specials. The Bob Sykes Blues Festival, a musical event put on by Bob Sykes, is a must-see every year. Make sure to check the website for the latest line-up of acts!